Researchers: Diego Melgar and Richard M. Allen, University of California, Berkeley; Jianghui Geng, Jennifer S. Haase, and Yehuda Bock, Scripps Institution of Oceanography, University of California San Diego; Brendan W. Crowell, University of Washington, Seattle; and William C. Hammond, University of Nevada, Reno. Combining geodetic and seismic measurements for the moderate 2014 Mw 6.1 Napa, California earthquake shows that rapid earthquake assessment is effective, even at the lower threshold of what can be detected with real-time GPS. Post-event rapid analysis reveals the earthquake characteristics, so in a future real-time implementation, early responders will have more information to know where to concentrate their efforts to mitigate losses. The seismogeodetic modeling also reveals a fast rupture on a dipping strike-slip fault and a branching of the rupture into multiple surface strands that are controlled by the shallow soft sediments in this popular wine region. 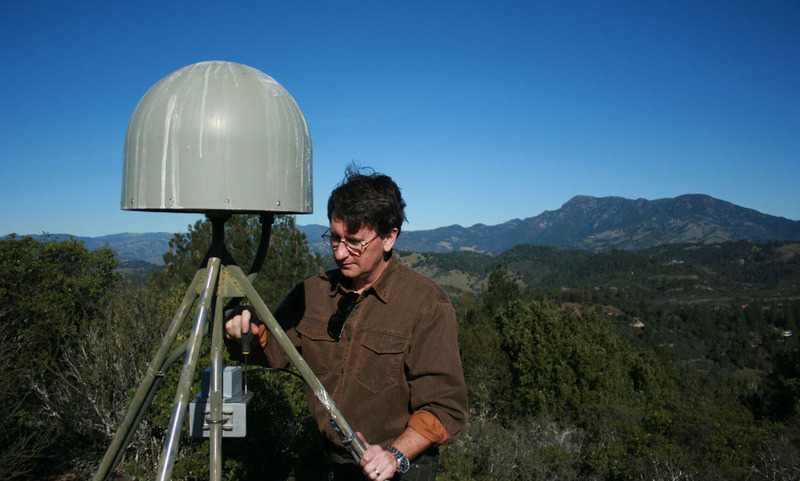 Traditional earthquake monitoring relies on seismic instruments, but recent advances have shown the value of geodetic instruments, such as GPS stations and radar imaging for rapid assessment of earthquake characteristics and peak ground motion. Now real-time, high-rate GPS data can determine peak ground displacement, a centroid moment tensor solution and static slip for medium to large earthquakes quickly. 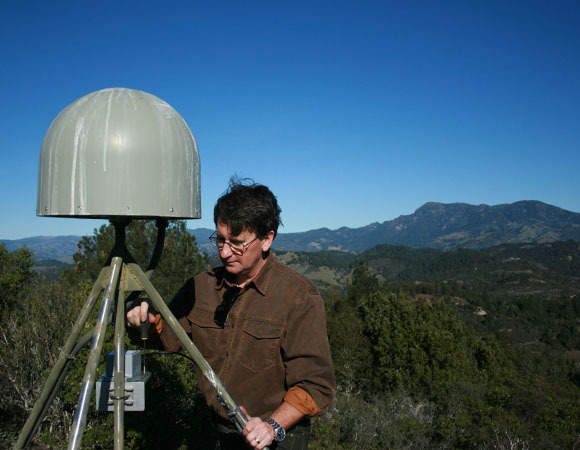 Here the authors use high-rate GPS data from UNAVCO’s Plate Boundary Observatory (PBO) and the Bay Area Regional Deformation (BARD) networks to characterize the Napa earthquake. Rapid absolute positions per stations are determined using techniques developed by Scripps Orbit and Permanent Array Center (SOPAC), the International Global Navigation Satellite Systems Service (IGS) and the Nevada Geodetic Laboratory (NGL). Next the high-rate GPS data is combined with strong motion data collected from nine accelerometers that are collocated with PBO stations. The combination yields broadband seismogeodetic velocity and displacement waveforms quickly without the typical systematic errors that are associated with independent seismic or geodetic techniques. 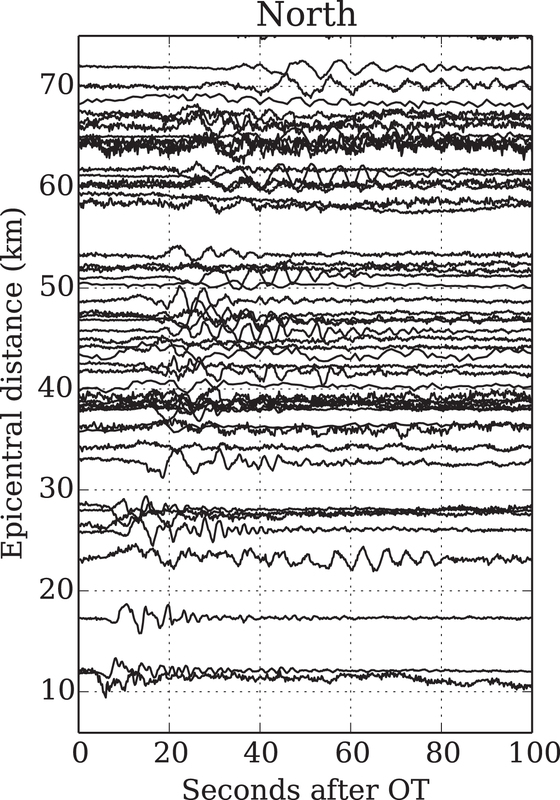 Thus this combined technique has advantages for any rapid assessment of medium to large earthquakes within dense observing networks. Finally, the dynamics of the rupture are modeled using all of the available data. The prototype early warning system in northern California estimated a 5.7 magnitude for the Napa earthquake within 3 seconds from seismic data. The GPS-derived peak ground motion displacement estimated a magnitude of 5.6 after 16 seconds and 6.0 after 45 seconds. These results are consistent with the fact that the magnitude of the Napa event is just above the threshold where GPS data can be helpful for early warning. The seismogeodetic data from nine sites provides a rapid estimate of the rupture dynamics for the Napa event. 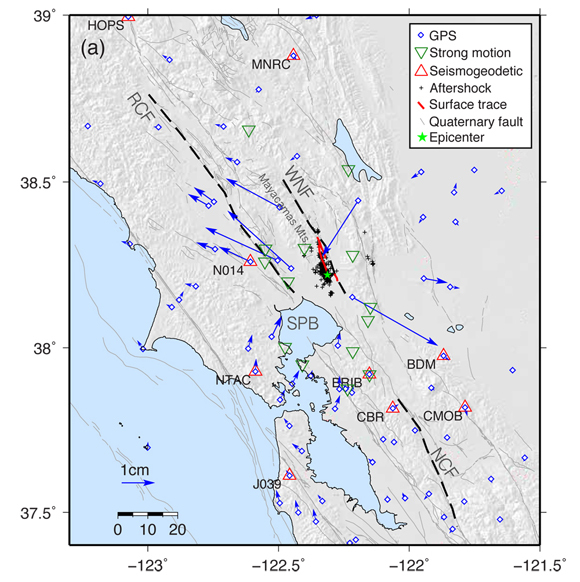 Adding more low-cost accelerometers at established GPS stations would improve the rapid kinematic modeling and potentially help with earthquake early warning in seismically active and populated regions. 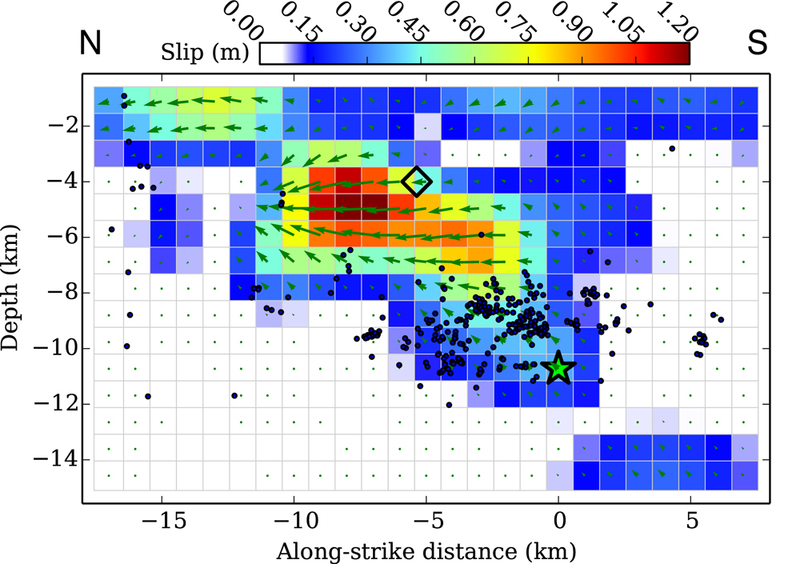 More detailed modeling with all of the seismic and geodetic data from the event shows the main rupture propagated to the north and updip of the hypocenter (about 3 to 7 kilometers depth below the surface) at a relatively fast slip rate of about 3 kilometers per second. The shallow slip (from 3 kilometers depth to the surface) is slower and distributed on multiple strands, which is consistent with rupture through softer sediments. Clearly using all of the available observations helps to unravel earthquake dynamics for science and society. Melgar, D., J. Geng, B. W. Crowell, J. S. Haase, Y. Bock, W. C. Hammond, and R. M. Allen (2015), Seismogeodesy of the 2014 Mw6.1 Napa earthquake, California: Rapid response and modeling of fast rupture on a dipping strike-slip fault, J. Geophys. Res. Solid Earth, 120, doi:10.1002/2015JB01192..